Tony Sheridan playing guitar alongside Cliff Richard at the 2I's Coffee Bar, Soho, London in 1958. 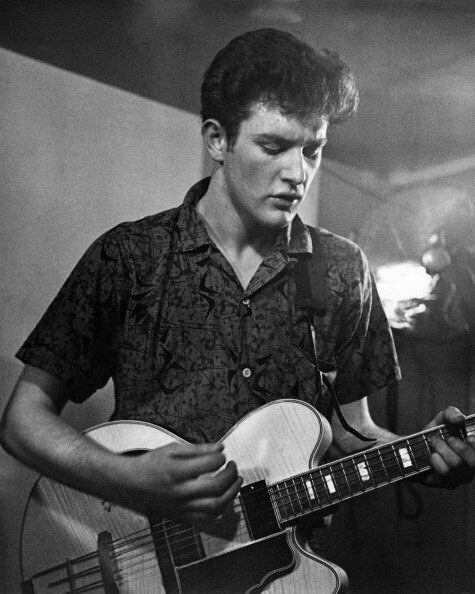 Tony Sheridan was born Anthony Esmond Sheridan McGinnity on May 21 1940 in Norwich. His parents enjoyed classical music, and by the time Tony was seven he had learned to play the violin. At Norwich School he played in the orchestra, sang in the choir, and appeared in productions of Gilbert and Sullivan operettas. In 1956, having also mastered the guitar, he formed a skiffle group and ran away to London, where he was soon playing in the Two I's club in Old Compton Street, Soho, by night, and sleeping in doorways by day. 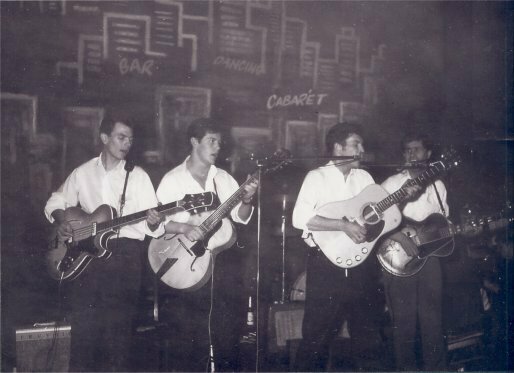 Norwich, 1956 one of Tony Sheridan's first performances with his Skiffle group The Saints. His fortunes improved when he appeared on the BBC's pop show Oh Boy! He was reputedly the first British musician to play the electric guitar on television (the BBC had hitherto banned the instrument), in rock classics such as Blue Suede Shoes and Mighty Mighty Man. The American journalist Bob Spitz later described him as a guitarist of extraordinary flair who, after backing stars like Marty Wilde and Vince Taylor, attracted a sizeable cult following of his own. "His rave 1959 appearance on Oh Boy! was one of those transcendent TV moments in which an unknown performer leaps from obscurity to stardom," Spitz noted. 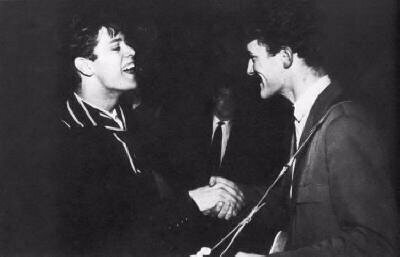 Cliff Richard and Tony Sheridan during the BBC production of the first TV music show "Oh Boy" in 1959. Perhaps the calibre of "stardom" he achieved was not recognised by the big names of American rock. 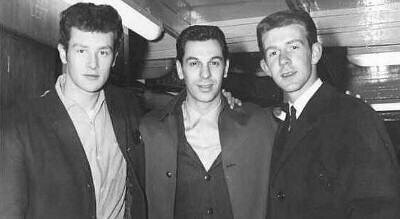 When Sheridan performed on a British tour by Gene Vincent and Eddie Cochran the following year, he asked if he could travel with them to the next venue. They refused him a ride, which meant he escaped the traffic accident which left Cochran dead and Vincent badly injured. On tour in England 1959 with Freddie Cannon and Ian Samwell. Later in 1960 Sheridan took a residency at the Kaiserkeller in Hamburg, playing with various British backing musicians, then moving to the glitzier Top Ten club where he met and worked with the Beatles. Their collaboration continued when the Liverpool band returned to Hamburg for a second time the following year, and was sealed when Sheridan and the Beatles cut their first disc together for Polydor, with My Bonnie on the A-side. The Jets at The Top Ten Club, Hamburg, July 1960. The front line left to right: Pete Wharton (bass), Colin Melander (guitar), Tony Sheridan (guitar), Rick Hardy (guitar).